All leather items are built from hand picked, #1 US tanned leather. All dyes are hand applied to the grain side only and hand oiled. All items are cut and assembled to US Army specifications. Hand stitching with correct threads and techniques can be done on special orders for complete authentic equipment. Unless hand stitching is ordered, all items will receive the same attention to detail except, they will be machine stitched with modern black threads saving productions costs. Leather is US #1 top grain leather, cut and dyed per 1861 US Army specifications. All hardware is US made and to military specifications, black japanned iron. 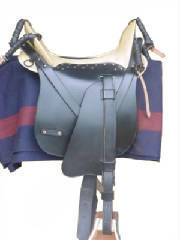 Saddle comes with blue web girth, and coat straps. 6 buckle Cavalry Headstall, Black with black hardware. 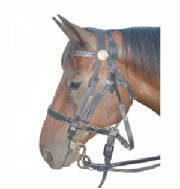 This is the primary headstall used by the Federal Cavalry. A three buckle headstall issued prior to 1861 was also made and were issued until supplies ran out (inquire for pricing). 1859 Civil War saddle bags. These bags are made to the US specifications with two pouches and leather draw strings. There is only one supplier of the correct type of leather for these bags. They are the correct grain, weight and oil content to hold their shape and meet the original specifications. Breast collar was a non issued item to the trooper, they were a priviate purchase item. Made with highest quality leather,hand dyed. Reproduction 1861 Model Curb bit with US rosettes on side. Choose between three different port sizes and two colors.